It’s been a brutal summer for going by bike – be it for commuting, errands or exercise, it was the hottest July on record. Yuck. And while August hasn’t exactly come in that much cooler, the past few days have been somewhat of a relief. Storm clouds cooled the sky on Monday, as I headed down the road on my skinny tires again to meet up with my friend Julie for a Monday night movie. I was a little warm by the time I got to the theater, but it made the typically sub-freezing theater feel OK. But it was after the movie, when I went to ride home that I was surprised by perhaps my first cool and refreshing ride in a very long time. The night was cool and there was a slight breeze. Seems like 9:15pm may be the perfect time to get a ride in! Not much traffic as I made my way home up Wilson Blvd in the bike lane, which, at times, can be a scary place between absent-minded pedestrians and clueless cab-drivers. But the ride made me smile, and glad that I was able to take my bike instead of getting in a car to drive the mile and a half or battle with metro. I felt refreshed and ready to take on another week of riding … with hopefully more cooler days to come! While my commuter bike is still out of commission with its de-funked back wheel, I’ve been taking to the streets on the skinnie tires, trying to utilize my road bike for transportation as feasible. We all know life gets hectic and there are never enough hours in a day to accomplish what you plan, so how do you still do it? Multi-task! Going by bike is a great way to multi-task getting things done all the while getting your work-out. This was my “hey I’m giving myself a gold-star” accomplishment last night, as I headed out on my bike to visit my parents. Summer time seems to fly by, and half the things you want to do never get done in summer no matter how much you do multi-task. For me, I think I still somewhat have the college mentality that you have nothing to do in summer, save for a part-time job or lab work. But no, summer is now compressed into weekends, weeknights and those few holidays and days off, but you still manage to make the most of it … and spend hours on the bike! That said – between races, trips and work, I’d been trying to find time to catch up with my folks before they headed out west for vacation, and after a busy weekend, it seemed that that wasn’t going to happen. Enter the bike! For most of us living inside the Beltway, getting outside of it on a weeknight is next to impossible, unless you want to spend an inordinate amount of time sitting in traffic. So, I opted to take my two wheels and ride the 20 or so miles it is from Arlington to my folks to say hi and have a good trip. No crazy DC-area traffic, just me, the W&OD and my bike for just a little over an hour and I got to see my folks, relax a bit, and get a good ride in to boot! Not a bad adventure by bike for a summer weeknight! 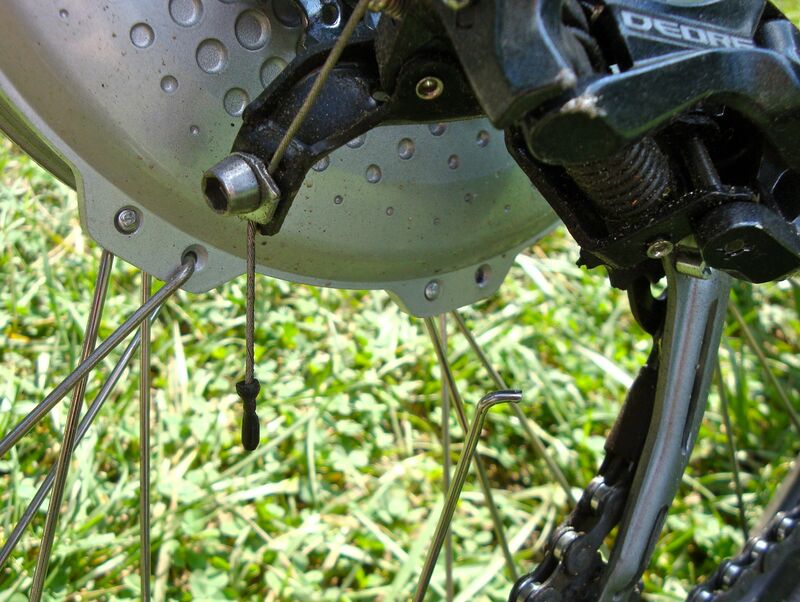 Well I was starting to get back into the swing of riding more to work in addition to my around-town trips, but just yesterday as I was riding home, I heard a “pop” followed by the tell-tale metal on metal clinking sound of another broken spoke. Ooops. It’s summer. It’s hot. It’s humid. And while it’s a great time to be enjoying the great outdoors, I’ve been having some trouble finding the motivation to ride an hour each way to work every day and at the same time things more interesting than riding in heat and humidity to write about. This morning the ride wasn’t too bad – the hide and seek storms of last night at least alleviated some of the humidity. I tried to shake things up a bit by taking the path instead of the road from the Zoo through most of the park, and while this is a bit slower, it was a lot less stressful as I didn’t have to constantly worry about slowing gas-powered commuters down. So it’s the little changes that keep the commute fresh and keep me on my toes. It’s not that I don’t like riding to work, I think if anything, I’ve gotten a bit bored and I’ve been really tired lately. My racing and training schedule hasn’t helped, as there have been days where I’ve had to chose between commuting and training. I’m not trying to whine here – just figure out a happy balance where I still enjoy riding my bike and it’s fun and not a hassle. I will say that as the summer as gone one, my local “by bike” trips have increased – more trips to the grocery, more short trips around town where it’s easier to go by bike, but I don’t get overheated and too sweaty. So while I’m getting weary of the daily 2-hour slug to and from work, I’m excited and motivated by more shorter trips around town. It’s easy, it’s save you $$ and you don’t have to look for parking, and it is the time of year when you can just get on and go without having to worry about layering up. Si, it’s been a while since I’ve been able to put anything up – between getting back from Mexico and hitting the ground rolling (literally…) I’ve been on the go more than not, but thankfully a lot of my going has been by two wheels. The past two weeks have been incredibly rough for doing anything outside, where you’d just break a sweat walking across the street to Starbucks to get your iced coffee. Ugh. August-esq weather in June. No fun. But thankfully, we’ve reached a welcome break and with mornings like we’ve had yesterday and today – going by bike is a perfect way to get around. I was quite excited this morning to see more folks than ever on two-wheels on the trails. I also noticed quite a few Capital Bikeshare bikes on the path too. Great to see a really neat program in action! And now back to getting rolling – while it has been almost unbearably hot (and yes, we did break a 100-year heat record last week) it hasn’t completely shut me down from going by bike. If you think about it – when you pedal, it can be like turning on the AC and for short trips, the AC in your car may not even kick in before you’ve reached your destination. Plus, with the heat and subsequent bad air-quality, taking the time to be environmentally friendly helps your lungs as well. I’m trying to take my bike as much as possible these days, everywhere from friends houses, to my kickboxing class to the grocery store. The trips aren’t too long and it’s way more fun than driving. So with the weather this perfect – take advantage of it – get out there and get rolling! Well folks, it’s one of those times again, I’m temporarily parking the bike and heading out into the wilds for work. 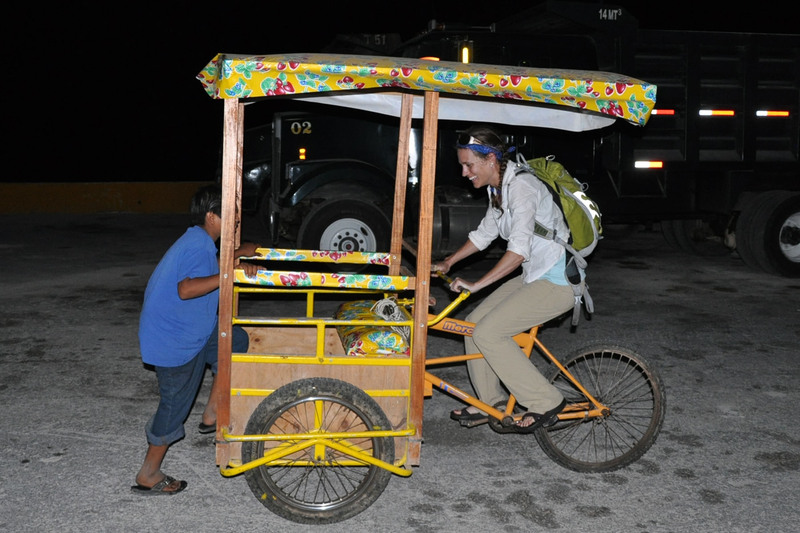 I’ll be trading my wheels for a pair of hiking boots and lots of bug spray as I’m heading down to the Yucatan to investigate some ruins of an ancient Mayan seaport! 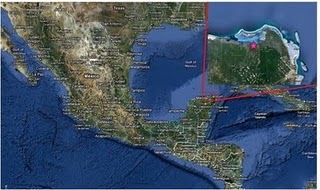 Back in time though for my next biking adventure – the 2012 Mountains of Misery! Bike DC is a great event sponsored by WABA, Bike Arlington and goDCgo. On Sunday May 22 participants will have the opportunity to ride 20 miles with friends and family on car-free (yes, car-free) streets, highways and parkways. AND if you register for Bike DC between now and 11:59pm tonight (May 5th) you can save $5 on registration (enter code CINCO) and $5 on a 2011 Bike DC T-shirt (enter code DEMAYO) So Happy Cinco de Mayo from Bike DC!! It’s been just over a year since I took on the challenge to go by bike, and it has been a pretty amazing year. I’ve ridden through the summer heat of DC, rainstorms, those gorgeous crisp fall days, and I survived the bitter cold winter and the snow and ice. Now as spring is finally in full swing, I’m still pedaling my way around the DC area. I’ll admit that there were some times when I really didn’t want to ride, and even times when I was going by bike when I sure wished I was going some other way. But I pedaled my way through, and more times than not was glad to be going by bike instead of going by car or metro. I’ve gotten to avoid traffic jams, but also had to deal with angry and impatient drivers, as well as some other cyclists and folks on the path who sometimes don’t get it…but on the whole, most folks I do see out on the paths are pretty friendly. There have also been a lot of people I’ve met and talked to because of going by bike. I do have fellow commuters stop and ask me about my bike, and the occasional motorist even at stop lights. Recently, I met some of the folks from Bike Arlington, who have been following my journey. And yes, I did get to meet Gary Fisher at the start of this challenge, and I did take is advice on an occasion or two and have attempted to ride in heels (interesting…) although I still have yet to figure out how to make / find a pair of ladies dress shoes I can clip in with. I like to think also, some evening shenanigans in Arlington on the bike helped fuel a new friendship, as a now close friend and I discovered that the bike can carry two passengers for short distances at least. And while taking the bike tandem is fun, it’s not exactly always practical and my friend has recently acquired his own commuter bike so we can both still ride – just not on the same bike. So yes, I hit 3,000 miles last week and have ridden the equivalent of traversing the continental United States, and the miles keep on adding up as I continue to turn the pedals and go by bike. I am looking forward to continuing my journey, adding on the miles and seeing what’s around the next corner. I’ve had my share of detours, road blocks and hills to climb, and I’m not the same girl I was a year ago by any means. I feel that I’ve learned a lot in this past year, I’ve learned a lot about myself and about other folks as well. I can’t really say I have any regrets, and while I’ll look back and smile on the positive things this past year has taught me, I’m most excited about looking forward, and continuing my journey by bike, with both old and new friends at my side and on my wheel. And finally – a HUGE thanks to the Bike Lane for starting me on this journey a year ago and supporting me as I have gone by bike for the past year! They’re a great shop, super-friendly staff and they have a great group of folks who ride for their team as well! It’s taken me almost a year, but I finally reached the 3,000 mile mark this afternoon on the bike. Three-thousand miles. 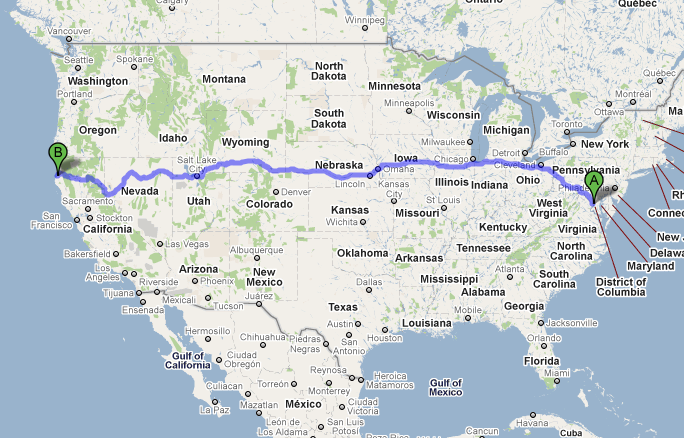 I’ve virtually ridden across the country, as from my home in Arlington, VA to Eureka, CA is 2,954 miles. That’s a really, really long way. Even driving, it would take over 2-days. But on a bike? I know it’s easy to get into the thousands on a road bike, when you’re putting in long training miles, but when you’re simply using a bike to commute from point A to B and back, it does take a while. And just like driving across the country, where the scenery changes, weather changes and sometimes your life takes twists and turns you never saw coming. Like any trip, be it by bike, or by car or even in life, when you travel a long way, you’re going to run into bumps, roadblocks, storms and things that make you think you’ll never get to your destination. But you find your tough, find the grit and determination you didn’t think you had and you get through, you survive and you realize that the obstacles weren’t as bad or insurmountable as you initially thought, then you go on stronger and with the knowledge that there’s nothing you can’t get through. I’ve virtually made it across the country, from sea to shining sea and there were times I didn’t want to keep going, and times I couldn’t wait to get on the bike as well. This Saturday will be the one-year anniversary of the start of my “Go By Bike” Challenge, and I’m glad I took on the challenge, and looking forward to keeping it up for at least the next year, because like with any journey, half the fun is not knowing what’s around the corner and sometimes the surprises that are waiting there for us.